Owing to their attractive border designs, these quilts create mesmerizing appeal. Clients can avail these quilts in various colors and designs as per their requirements. Indian handmade Double Bed Quilt is made from cotton fabric. This piece is adorned with print design. 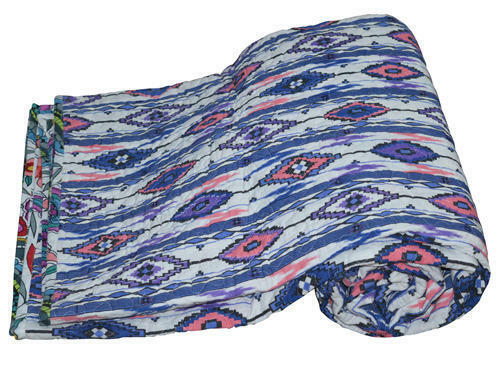 Radiant printed quilt is made from 100% cotton fabric. It has marvelous work by our hardworking team. Bring this unique piece and add a traditional style to our home. We are leading manufacture, supplier, retailer, exporter and wholesaler of cotton silk textile. Hand Block Printed Quilt. 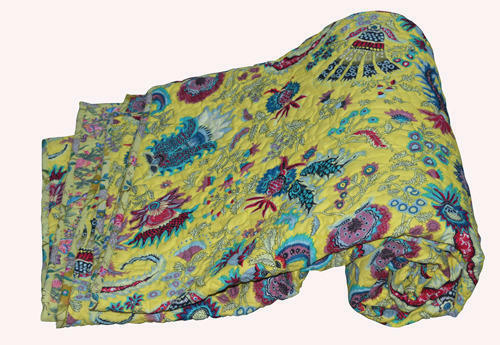 Indian traditional handmade cotton quilt is decorated with block print design. This piece is totelly made from 100% cotton fabric. It is handmade product by our rural artisans of Jaipur, Rajasthan. We are leading supplier, manufacture, retailer, wholesaler of home textile. 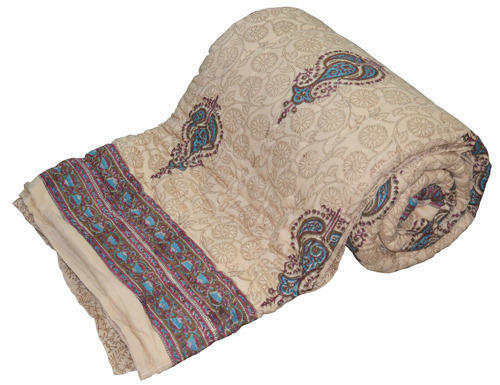 Rajasthani Print Cotton Double Bed Razai Quilt is made from 100% cotton fabric. 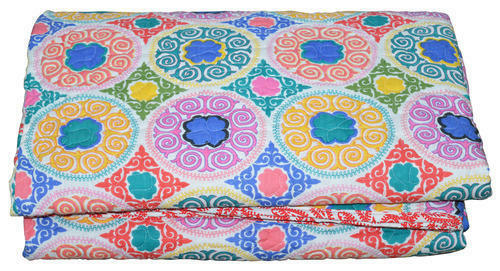 Indian handmade pretty cotton quilt is decorated with print work. This totally handmade product by our rural artisans of Jaipur, Rajasthan. We are manufacture, supplier, wholesaler, retailer and exporter of home textile. Bring this magnificent piece to decor your home and add a splash of Indian Traditional Style. Indian Jaipuri Block Printed Quilts. Handmade cotton quilt is decorated with block print. It is made from 100% cotton fabric and adorn with attractive print design. We are leading manufacture, supplier, wholesaler, retailer and exporter of home textile. 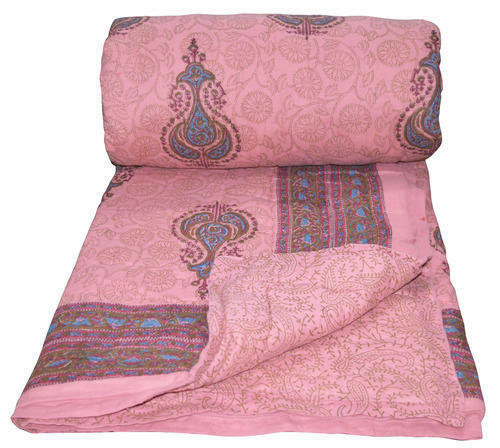 Unique color pink quilt will give your home a dashing look and the work of block print will add a traditional style to your home. 1.Indian handmade Jaipuri Quilts Quilt is made from cotton fabric. This piece is adorned with print design. 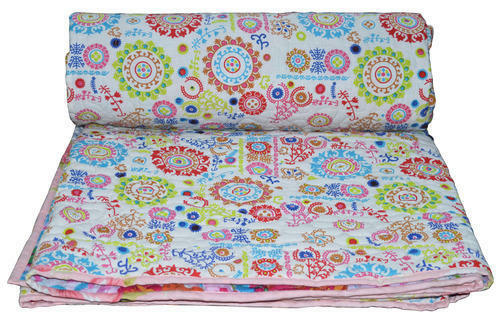 Radiant printed quilt is made from 100% cotton fabric. It has marvelous work by our hardworking team. Bring this unique piece and add a traditional style to our home. We are leading manufacture, supplier, retailer, exporter and wholesaler of cotton silk textile. 1. We offer you handmade Floral Print Quilts. This is totally handmade by our rural artisans and decorated with beautiful flower print work. This unique cotton quilt is made from Jaipuri cotton fabric. 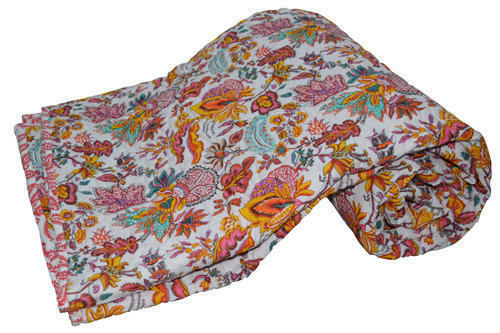 Ramdev Handicrafts offers you our handmade magnificent print work cotton quilts. This is in dazzling white color. We are suppliers, manufacture, explorer, retailer and wholesaler of cotton silk fabric textiles like cushion cover, quilts, bed sheets, girl’s jackets ottoman and many more items.